The Federal Reserve offers custodial services for foreign central banks. Precisely which countries use these services is confidential as is who patronizes a commercial bank's services. There was a large draw down in the Treasuries the Fed holds for foreign officials beginning last September and running through mid-March. During this period, the Fed’s custody holdings of Treasuries fell from $3.024 trillion to $2.974 trillion (see the Great Graphic from Bloomberg). The US dollar has come back better bid after initially extending yesterday's pullback. The euro pushed to $1.1330 after having dipped briefly below $1.1200 yesterday. However, despite what appears to be an approaching brink with Greece, a softer than expected German ZEW survey, and the two-day FOMC meeting that gets underway today, the euro remains fairly resilient. The most important driver of the dollar remains the de-synchronization of the monetary policy cycle. The early and more aggressive action by the US, and the institutional flexibility, leaves the Federal Reserve in a position to begin normalizing monetary policy several quarters at least ahead of the Eurozone, the UK and Japan. Other countries, including China, Australia, New Zealand, Sweden, and Norway are also in the process or are anticipated to be, of easing policy as well. The substance of what ECB President Draghi contained few surprises. The tone was cautiously optimistic that the worst is past for EMU. The US dollar is broadly higher as yesterday's gains are extended. The driving force is not so much a shift in perceptions of the US economy, though the San Francisco Fed that claimed seasonal adjustment quirks are behind the repeated weakness in Q1 GDP helped market sentiment yesterday in North America. This Great Graphic comes from the Wall Street Journal. 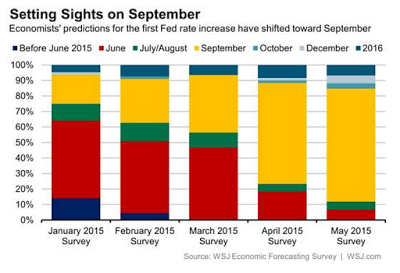 It shows the evolution of market expectations for the first Fed rate hike from the monthly survey it conducts. At the start of the year, many economists, like us, thought that a June hike was the most likely scenario. However, the weakness of Q1, and especially the poor job growth in March, spurred a rethink. One of the most important forces shaping the investment climate is that the US is closer to beginning to normalize monetary policy than other major countries and regions. That gap may be measured in years, not months or quarters, and has not reached the apogee. The Federal Reserve will likely hike rates in the next six months, while other major central banks, from Beijing and Tokyo and Sydney, to Frankfurt and Stockholm, that are providing monetary policy for nearly 2/3 of the world economy are still committed to easing policy. The Swiss National Bank announced today that as of May 1 the negative rate charged for sight deposits would be applicable to most institutions that were previously exempt. Many saw this as an easing move by the SNB and sold the Swiss franc in response. Can Divergent Monetary Policies Prevent US Dollar Losses? The US dollar fell against the major currencies and many emerging market currencies last week. Punished by disappointing data, it threatened to breakout of ranges that have confined it. However, the third consecutive upside surprise on core CPI helped the greenback stabilize ahead of the weekend. The price action reinforces our sense that after trending for several months, the dollar has entered a consolidative phase. Trading is choppy, and positioning stretched, but the divergence of monetary policy trajectories will likely prevent sharp dollar losses.